Ekaterina Neroznikova is a reporter and columnist who writes about the North Caucasus. She writes for a number of publications about politics, international relations and human rights in Russia. Ekaterina Neroznikova is a reporter and columnist who writes about the North Caucasus. She writes for a number of publications about politics, international relations and human rights in Russia. Russians are the largest ethnic minority in the Republic of Chechnya, although according to the 2010 census, they make up just two percent of the population. Ramzan Kadyrov, the country’s leader, calls the republic, “a model of interethnic and interfaith peace and harmony”. But what lies behind the rosy picture painted by the official federal and Chechen media? I recently spent six months in Chechnya, where I was in close contact with both Chechen and Russian communities. The label “Russian”, however, applies here to anyone who self-identifies as such. They might be ethnic Cossacks, Ukrainians or Armenians, but what unites them is their religious identity: they are all part of the Russian Orthodox Church. 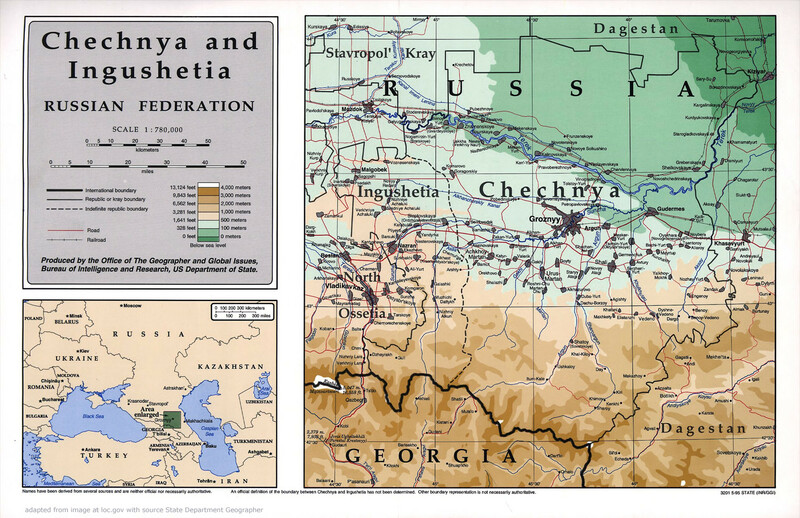 According to official figures, in 1979 over 30% of the population of Soviet Chechnya were ethnic Russians. By 1989 the figure had fallen, although not by much – they still made up 25% of the population. In 2002, however, less than four percent of residents were Russian, and by 2010 Chechnya was losing its Russian population faster than any other North Caucasus republic. It was, effectively, a mono-ethnic member of the Russian Federation. Reports of ethnic cleansing emerged under Djokhar Dudayev (1991-1996). Oleg Orlov, the head of the Memorial human rights centre’s North Caucasus programme told me that both he and Russia’s Human Rights Ombudsperson Sergey Kovalev had witnessed harassment of Chechnya’s Russian-speaking population. In the early 1990s, the non-ethnic Chechen part of the population began a mass exodus from the republic, and those who didn’t leave were squeezed between Chechen militants fighting for independence on one side, and Russian armed forces on the other. Lyusya’s family was in a similar situation. Lyusya (name changed), together with her brother and her elderly bedridden mother, live in a small, dilapidated house. Lucy has to do most of the housework and care for her mother herself: her brother spends most of his time alone, absorbed in his reading. I only managed to talk to him once – he showed me some Masonic symbols he’d found on old plans of the city. Before the war with Russia, Lyusya’s brother was perfectly normal, but then something happened that permanently changed him. Russian forces were rounding up men with beards in town – a sign, in soldiers’ eyes, of possible allegiance to militant groups – and Lyusya’s brother was captured. He also had a beard. The only reason he wasn’t shot, as it turned out, was that he was wearing a cross around his neck. He still had to plead with the men to look at him and see that he was “one of them” and didn’t have to be killed. A cross didn’t necessarily save your life at the time, but it worked for him. It’s hard to say for certain whether Chechen rebels or the local residents harassed Russians. There were known cases of fighters bringing lone Russian women flour and water to make bread and making sure that none of their fellow-rebels offended them in any way. Anna Pavlovna (not her real name) retired many years ago. She came to live in Grozny with her husband when she was young, worked in a factory and was well-respected locally as the 1990s began. Her life wasn’t easy – both her husband and her two sons died young. She now devotes her time to her garden, where she grows fruit, delicious grapes and masses of flowers. And, like most Russians still living in Grozny, she is a staunch churchgoer, and has even planted lots of flowers around the building. These stories have happy endings. After all, we only hear from the people who have survived. We don’t know what happened to those who didn’t. During the First and Second Chechen Wars, Anna Pavlovna had to leave her house several times and move to the city of Stavropol, over 400km to the northwest; a Chechen neighbour also took her to live in his village with his family for a while. But she remained in Grozny for most of the war. Once, during the first campaign, a young Russian soldier was brought to her house. Chechens had found him in the woods – he had left his post and was in hiding. As Anna Pavlovna recalls, he was starving and his hair was full of lice. The men brought the Russian to her home to save his life, though it was unclear who in particular was after him. The rebels might have killed him, but his own side could have convicted him for desertion. The lad lived at Anna Pavlovna’s house for nearly six months, and all that time she and her ex-colleagues (the factory had already closed down) searched for his family, so he could return home. And they found them in the end and his mother came for him – she hadn’t even known that her son had been posted to Chechnya. Another Anna (again, not her real name) lives in an old Cossack house, so old that it is already partially collapsed into the earth, and inside it has a smell of a dying house that she can’t get rid of, however much she washes everything. During the war she was blockaded within these four walls with her blind and sick mother: the neighbouring houses were all occupied by rebel fighters. Like many civilians, she was often visited by rebels in search of food and drink. One day, one of her visitors sat down beside her and placed his hand on her knee. Anna was so scared that she couldn’t move, but other “guests” noticed and quickly took him out of the house. The next day, a fighter whom she hadn’t seen before turned up at her house and asked whether anyone had been offending her, and after she told him about the previous day’s incident he said, “They won’t be back”. And indeed, she didn’t see the insolent visitor ever again. These stories have happy endings. After all, we only hear from the people who have survived. We don’t know what happened to those who didn’t. There are, unfortunately other stories, ones in which Russians were robbed, beaten and thrown out of their own houses. They are wary of telling their stories: fear of someone finding out and coming to harass them has taken a firm hold on their consciousness ….